Armani Hotel Dubai is the world’s first hotel designed and developed by Giorgio Armani. Located inside the iconic Burj Khalifa, the world’s tallest building, the hotel is the realization of the designer’s long-held dream to bring his sophisticated style to life in the most complete way and through the “Stay with Armani” philosophy. The lobby, nestled between three glass pavilions at the base of the tower, reveals a cool, obscure ambience dominated by a tubular arch construction overhead. The Lobby Lounge weaves a tale that is translated through an artistic vision. The sandy tones with midnight shimmer salute a culture rich in heritage, and customs where views to the outside showcase the growing Gulf life, celebrated with Italian style apperitiffs and friends. Exploring the concept of luxury gift-giving at your fingertips, the lobby lounge flanks a beautiful double-volume wall of jewelry displays, leading toward the guest lifts that unfold to Armani gift stores which feature fashion, jewelry, chocolate, flowers and more. The suites are completely outfitted in Armani Casa furnishings with earthly tones and textured fabrics the designer is known for. The guest corridors, with their zebra paneled wood, are trimmed with LED cove lighting at the base for a sleek look resembling a sci-fi catwalk. Each food and beverage venue is positioned within an aura of refined luxury, while blending traditional recipes with modern interpretations. 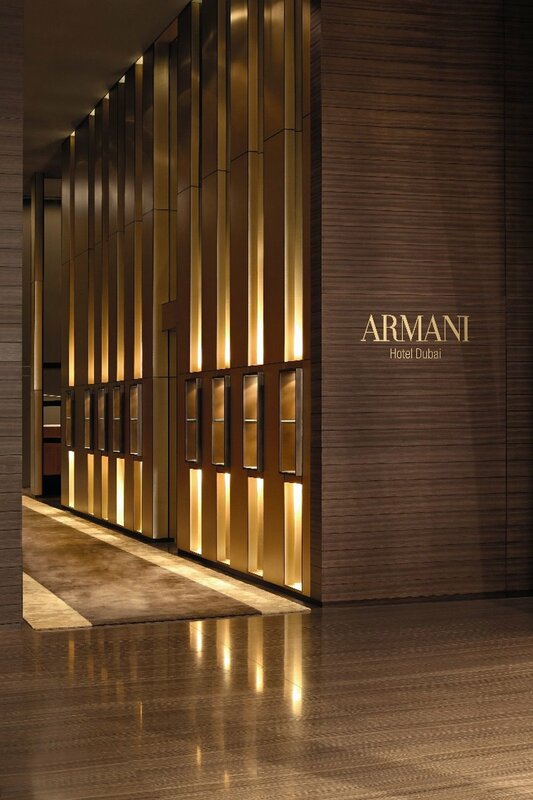 Armani/Ristorante is a modern Milanese style restaurant with open spaces and private rooms surrounded by exquisite selections of the finest wine. The standing lamps at individual tables arch in humbleness to greet the guest and stand as a sculptural element. The softness and materials of the background present the guest as the main subject upon a rich canvas. Armani/Mediterraneo, elegant in its subdued tones and rich textures, allows the stream of natural daylight to decide its presentation while welcoming guests with the warmth of a Mediterranean home. Armani/Hashi is a perfect depiction of Japanese simplicity and elegance translated through beautiful green bamboo stone, green and red details, and natural bamboo. Armani/Amal Indian restaurant at Level 3 is a modern interpretation of a culture that is steeped in history, interpreted as a sepia reflecting restrained forms and touches of deep colors.